Cut the eggplant into bite-sized pieces, slice the bell peppers, green onion, ginger, and garlic. Dust eggplant pieces in potato flour. 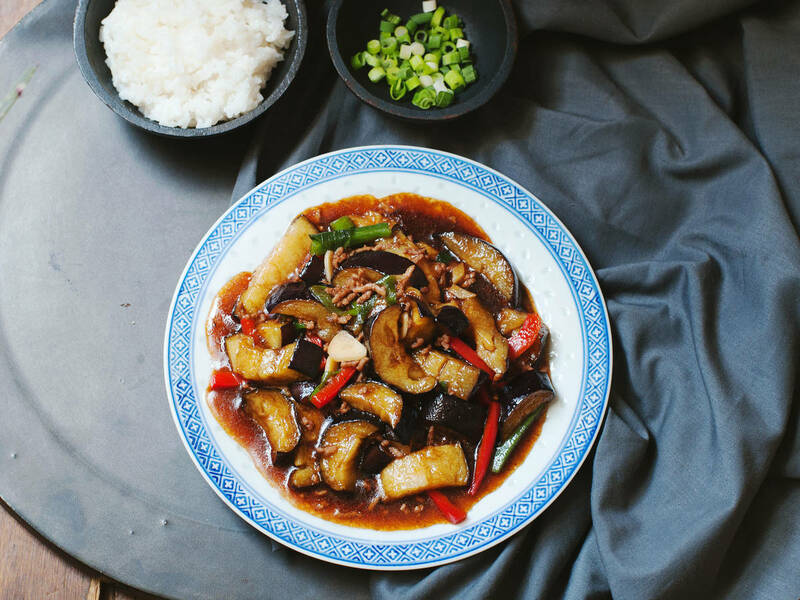 Heat enough vegetable oil to cover eggplant in a wok over medium-high heat and add the eggplant. Fry until golden brown. Remove eggplant from oil and set aside. Discard oil. Coat wok in a little oil and set over medium-high heat. Add the the peppers, green onion, ginger, garlic, ground pork, soy sauce, starch, and water to the wok and stir to combine. Fry until fragrant, then add sugar, pepper, fried eggplant, and salt to taste and cook for approx. 1 min. more. Transfer to serving plate and enjoy!